Well, I missed the Live Rust tour but I did get the next best thing; I saw the movie Rust Never Sleeps which is most of the show at the Cow Palace in San Francisco. I was temporarily in central California and saw that the movie was playing in Sacramento so I headed up there and watched it twice. I even got a pair of Rust-o-Vision 3d glasses. 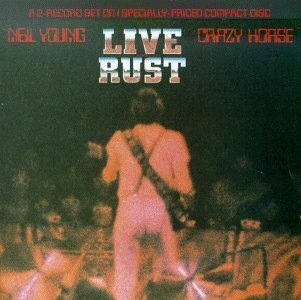 I was starting to feel a bit better about missing the show because this was rapidly becoming the most well-documented tour in Neil's career as far as retail item availability; some of the RNS album was from the tour, the movie RNS which was the very concert I had had tickets to but missed and finally the album Live Rust which is the subject of this post. I'm really glad I had seen the movie before I got the album because it gave me a good idea of what the stage show was like and put some of the things like the Woodstock announcements in perspective. This is one of the best live albums by anyone, IMO. You not only were able to get a pretty good overview of Neil's career up to that time, but you could crank this in your headphones and get some idea of what it was like to attend a Neil Young show. I preferred to refer people interested in Neil to this album as opposed to Decade because they could hear something of what Neil was all about and then go out and buy the other albums and be left with different versions of the songs. The RNS/Live Rust tour was a big one for Neil. He received huge accolades from critics. He had better record sales than he had had in a while. Rolling Stone named him the artist of the decade. I did not know at the time about the turmoil that started in Neil's personal life in '79 but I did know from the past that if the public started perceiving Neil in a certain way that he was apt to distance himself artistically as far as he could from that perception. RNS/Live Rust gave me/us some great material to listen to and I liked that very much. But I also did not know where Neil could go from there and truth be known I liked that too because I suspected it would be an interesting ride. I very much enjoyed listening to Live Rust today. More on Rust Never Sleeps album.